My outdoor experience began in high school with a canoeing/camping group which made a 10-day voyage through the Quebec wilds. I've been backpacking since my college days in Pennsylvania. I have hiked all of the Appalachian Trail in Georgia, Tennessee and North Carolina. 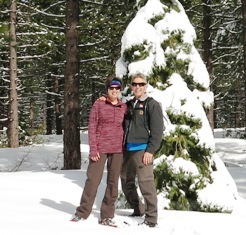 My typical trip now is in the Sierra Nevada in California and is from a few days to a few weeks long. 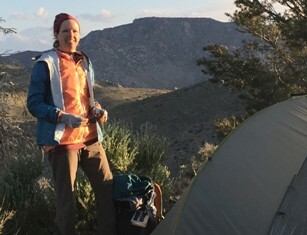 Over the past few years I have lowered my pack weight to a lightweight base weight of 15 lb (6.8 kg) while still using a tent, stove and quilt. The Ex Officio Terma 1/4 Zip Shirt is a long-sleeved shirt with a natural fit. The fabric is 54% Acrylic, 27% Polyester, 14% Rayon and 5% Spandex. This synthetic blend is listed as wicking, quick-drying, sun guard to 30+ and stretchy. The fabric has SILVADUR technology which is supposed to release silver ions to eradicate odor-causing organisms on the fabric. The zipper extends down mid-chest and has a storm flap behind it. At the top of the zipper there is a zipper garage. The zipper pull has a nice coated tab that is easy to grip. The sleeves are extra-long and have thumb holes. 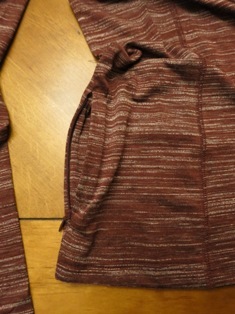 The hem is straight across and is long enough to extend down over the hips. 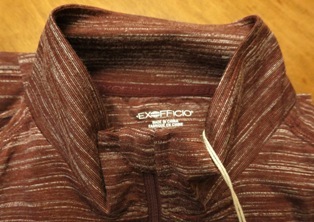 At the lower left front of the hem there is a small Ex Officio logo that almost blends in with the heather fabric. There is a small zippered pocket on the right-hand side at the lower seam. The seams are a flat-lock construction to lie flat under other garments. Along the sides there are contoured seams making a women's princess cut shape to the shirt. The shoulder seams are straight across but are slightly off-set toward the front making them not sit directly atop the shoulder. This is nice for comfort when wearing a pack. My initial impression was that the shirt seemed large. I'm so accustomed to tops being athletically fitted and tailored for women that I haven't worn a top this large in many years. This is the first shirt that I've owned of this brand so I wasn't familiar with their sizing. I had consulted the size guide before choosing a size but if I had tried it on, I definitely would have chosen one size smaller. With the longer length sleeves and longer length hem the looser fit is only accentuated. The fit is listed as Natural on the website. Other than the size issue, the shirt appeared very much as I expected based on the website information. 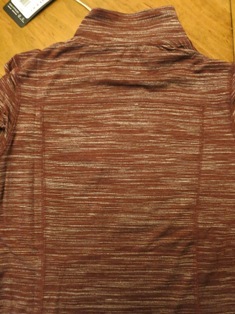 I like the heather color much better than the other solid colors that I own in my base layers and shirts. I don't currently own many synthetic layers so I'm interested in how well this shirt resists odors especially over time and how well those odors wash out in the laundry. I've had synthetic shirts before that like to hold aroma even after washing. I find thumb holes to be very useful so I'm always happy to see base layers, shirts and even jackets which include them. I love them in the winter for keeping my hands a little warmer without gloves and for use under gloves to keep snow from touching my wrists. The small side pocket looks great for holding my small wallet or a key or possibly my phone. I'll be looking forward to trying that out especially as the weather warms up and I'm not wearing a jacket over top with other pockets available. That will be later in the test period though since it has been cold lately! 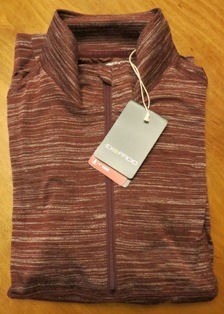 The shirt seems to be of very high quality construction with some thoughtful details such as the zipper garage at the neck to protect my skin from touching the zipper and the aforementioned hidden pocket. The tag instructions say to machine wash in cold water with like colors. No bleach or fabric softeners are to be used. Then the shirt should be tumbled dry on low and removed promptly. Ironing is to be done at a low temperature. All of this seems pretty typical but I'm a little surprised to see that it is ok to put something with Spandex in the dryer. I'm always so worried that my clothing will shrink to Barbie size that my husband is on strict orders to NOT put any of my clothes in the dryer. So, I will likely end up washing this shirt by hand on occasion and lying flat to dry since I'm so used to doing with this other technical gear. However, due to it being so large on me, I may try the dryer to see it if will shrink a little. The Ex Officio Terma 1/4 Zip Top is a high quality construction shirt made of synthetic materials. 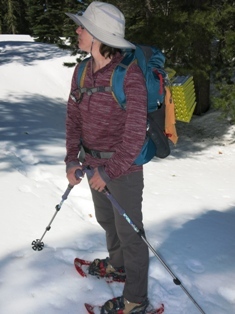 I wore the Terma as my go-to shirt this winter and wore it for one four-day backpacking trip, one three-day fishing/crabbing trip, seven snowshoe day hikes, eleven morning runs and several short hikes or walks. I also wear it to the gym and around the house if it isn't in the laundry! The Terma certainly got a workout during this test period. It was the perfect weather for a long-sleeved layer. Due to the loose fit of the Terma, I usually wore a base layer underneath. I then layered a fleece and/or softshell atop if needed. I tried to tuck the shirt in for snowshoeing, but the shirt is so long that I preferred to not tuck it in if I could avoid it. For sleeping I prefer to tuck in my shirt to keep the cool air from coming up my back, but with the Terma I just pulled it down over my hips. It is so long that it usually stayed down enough to not bother me. The collar even when completely zipped up didn't really go up my neck high enough or fit tight enough to provide much warmth. I usually added a neck gaiter to keep my neck warm. I used the thumb holes quite often and love having them to keep my wrists warm. When I didn't use them, I had to roll up the sleeves quite a bit to keep the cuffs in a reasonable spot. I used the hidden pocket a few times but didn't really like having something in that area since it interferes with the hipbelt on my pack. And when running I didn't like the bouncing around of the item (like my phone) so I didn't really use the pocket. The first time that I washed the shirt I did it by hand in cold water and with detergent made specifically for technical clothing. The red color bled a little so I was happy that I had washed it alone the first time. The second time, I machine washed it on cold with dark clothes that were mostly black. I didn't expect the shirt color to bleed again but it did. Fortunately the black clothing didn't suffer any ill effects except for my husband's compression shorts which now have a pink logo around the waistband. Fortunately his softball teammates will never see it and he doesn't really care. I ended up washing the shirt ten times in the machine on cold and either drying flat or tossing in the dryer for a short time and then drying flat. Given all of my wear, that means that I wore the shirt several times between washings. I never noticed any foul odor and the Terma continues to wash up nicely. Despite some off-trail bushwhacking there wasn't any issue with snagging of the fabric. There is no pilling of the fabric, no difficulty operating the zipper and no other wear problems with the shirt. We continued to have the perfect cool weather for the Terma shirt so I was able to wear it multiple times per week. I wore it for two backpacking trips, seven morning runs, several softball games, mountain biking and multiple trips to the gym. I also wore it around the house if it wasn't in the laundry. The shirt continued to be a great go-to layer for cooler weather. It isn't particularly warm but provides surprisingly good warmth for such a lightweight layer. I wore it as a sole layer on many occasions such as for sleeping on our backpacking trip, for running and to the gym. Since the shirt is quite large for me I actually prefer to wear something underneath when the temperatures cooperate and usually wear a wool short-sleeved shirt. Terma is under all those layers! 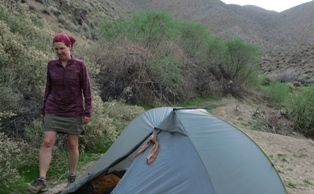 On the backpacking trip we had one day where we woke to snow overnight in the desert and had a cool day of high winds. I was covered from head to toe to protect my skin and loved having the Terma under my wind jacket. The thumbs holes also helped to keep my wrists covered. There were times that there was something digging into my hip when I tightened my backpack hip belt. I found that the side pocket zipper on the Terma was in just the right spot to cause this discomfort. So I usually had to unzip or otherwise arrange the zipper pull to avoid having it sit right below the hip belt atop my hip bone. I liked wearing the shirt for sleeping since it is long and has the thumb holes. The length keeps it down over my hips and from riding up my back at night. The thumb holes keep the sleeves down and provide warmth for my hands without needing gloves. I probably washed the shirt another eight to ten times in the machine on cold but I resorted to drying in the dryer on low heat in hopes that it would shrink somewhat. It never seemed to change size or have any other ill effects from machine drying. The Terma continues to resist odor despite multiple wearings between washings. On the backpacking trip I wore it every day at least for sleeping if not for hiking and it still seemed perfectly wearable on the sixth day. The fabric has held up nicely except for some light pilling where my backpack straps rub. Otherwise there are no wear issues to report at all. Overall the Terma has been a versatile long-sleeved layer with a tough fabric that doesn't seem to hold foul odors. This concludes my Long-Term report and this test series. Thanks to Ex Officio and BackpackGearTest.org for the opportunity to test this product. This report was created with the BackpackGearTest.org Report Writer Version 1. Copyright 2017. All rights reserved.